What’s the difference between quartz vs granite? Which is harder, quartz or granite? What is the heat resistance of quartz vs granite? The answer? Quartz and granite are both stone products and they’re both in high demand, but the similarities end there. Read on to see how they differ in terms of appearance, heat resistance, scratch resistance, and care. Granite is natural stone. It’s composed of three different minerals (quartz, feldspar, and mica) and is cut from rock quarries in giant slabs. Because it’s natural, granite comes in a wide range of colours and patterns. No two granite countertops will be the same due to the natural variations in the stone. Quartz is engineered stone. Ground quartz is combined with resins and polymers that form near-indestructible bonds. Because it is engineered, the appearance can be controlled somewhat. The colours and patterns can be customized to a certain extent. Granite is a durable stone, used in buildings and memorials for centuries. You’ll need to use a cutting board on your granite kitchen countertops – but that’s to protect your knives, not the stone! Because granite is one of the hardest materials in the world, cutting directly on it will dull your knives extremely quickly. It is possible for granite to chip or crack, however, if something heavy is dropped on it. Avoid dropping heavy pots or pans on your granite surface. Quartz is harder than granite. 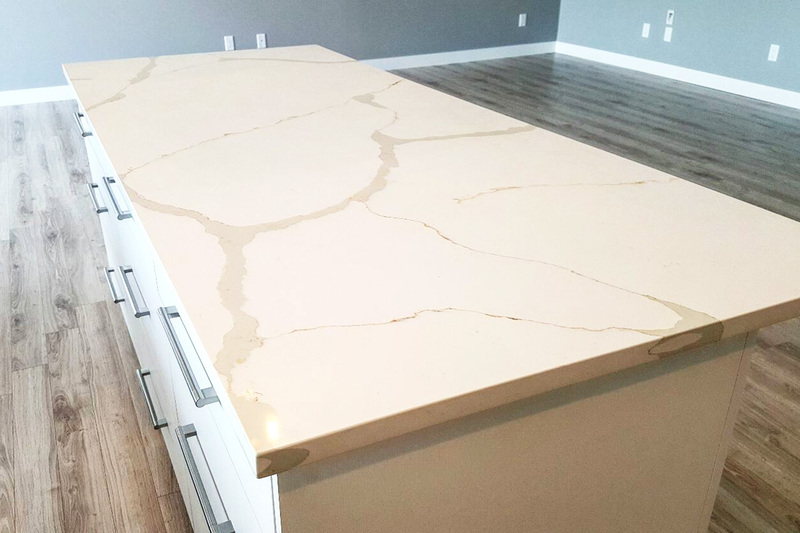 In fact, quartz is as scratch resistant as a countertop can be – but that doesn’t mean it can take prolonged jabbing with a knife or sharp tool. A cutting board is always a good idea, not only to eliminate any danger from knives but also to keep a sanitary surface where you prepare food. A quartz kitchen countertop is able to repel moisture. Can’t get to that spilled tea or red wine immediately? Not a problem. Quartz will hold its own against the spill until you get to it. Similarly, contaminants, such as germs and odors from raw meat or fish, will not penetrate the surface; your countertop will remain hygienic and odor-free. Other the other hand, granite is porous. As such, it is susceptible to stains. It needs to be sealed upon installation and then resealed as needed, typically on an annual basis. If you spill a liquid such as wine or grape juice on your granite countertop, clean it up immediately. In this quartz vs granite countertops issue, quartz is the winner. Quartz has a reputation for withstanding at least 300 degrees F, but problems can occur when the change in temperature is sudden and drastic. For instance, placing a roasting pan right from the oven onto the counter and leaving it there while you finish dinner is asking for trouble. We recommend using trivets or hot plates on your quartz kitchen countertops. By contrast, granite is extremely resistant to heat . Have to put that hot pot or pan down in a hurry? No worries with the granite countertop. However, using a trivet or hot pad is still a good idea to protect the counter from grime on the bottom of the pot or pan that might scratch or pit it. There’s also the risk that the sealant used to seal the granite could burn or discolour from the heat. In this quartz vs granite countertops issue, granite is the winner. Cleaning quartz is easy! Use a soft cotton cloth or paper towel with warm water and mild dish soap. You can also spray it with a cleaner designed for quartz countertops then wipe it clean. Dried on food, grease or gum can be scraped up with a plastic putty knife, then cleaned as usual. Granite is also easy to clean—a soft sponge and soapy water, a gentle cleansing scrub for stubborn stains. Don’t use abrasive pads or steel wool, bleach, ammonia or ammonia-based products, acidic products such as vinegar. As with quartz, read the labels before using cleaners. In this quartz vs granite countertops issue, both varieties of stone are easy to clean. In conclusion, the quartz vs granite countertops debate leans towards quartz, but both stones have benefits and drawbacks. Your choice depends on your lifestyle and the kind of use your countertop will get. Both will improve the aesthetic quotient of your kitchen and can last up to 50 years. See what kitchen countertop styles are most popular right now by visiting our countertops page.